Paul Krugman keeps posting the graph above of British public debt to GDP (arguing that modern levels of British debt are not a problem - and by extension other countries with their own currency). But shouldn't it be noted that prior to the 1950s, Britain had a large empire which it could and did tax? I seem to remember that caused some annoyance in certain colonies. Thus the economic base that could be used to service British public debt was much larger than indicated by Gross Domestic Product, no? That sounds right to me. Also, the world economy was expanding rapidly through most of this period, probably driven largely by the ready availability of cheap fossil fuel. Doesn't the belief that running up debt is OK include the assumption that eventually economic growth will outpace that debt? What if economic growth slows, or stops? Krugman keeps ignoring the possibility that the days of rapid economic growth are over due to resource constraints and that we should consider how a steady-state economy would best function. It's hard to see how rapidly running up debt could be beneficial in a slowly growing or steady-state economy. Britain gave up its empire because of the costs not the profits. 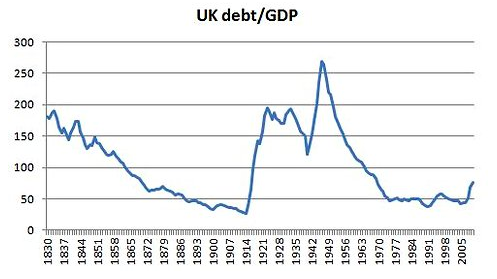 I am guessing some part of the rising debt up to the end of WWII was due to the costs of empire (profits went largely to corporations and individuals) and that the decline in debt post-WWII was due in part to the successful divestment of colonial costs. Britain gave up its empire quite willingly and largely peacefully (with a couple of notable exceptions), other colonial nations did not. Fairly obvious point: that chart shows that the WWII debt unwound in an era when the empire was breaking up. Also, after the era of High Victorianism, it is generally recognised that the empire was a net drain on Britain's financial resources.